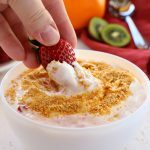 This Strawberry Cheesecake Fruit Dip is the perfect low fat summer treat! It's easy to make with only a few simple ingredients and it's a crowd-pleaser! Add the cream cheese to a bowl and whip on high speed using a hand mixer (until fluffy). Whip in the powdered sugar until combined. Fold in the whipped topping and mashed strawberries until combined. Add to a small bowl for serving and garnish with the graham cracker crumbs, if desired. If preparing in advance, garnish with graham cracker crumbs just before serving to ensure they stay nice and crunchy. For a lighter version, substitute the cream cheese with Greek Yogurt!